What’s the weirdest thing you’ve done on your travels recently? Ever wish you were a mermaid when you were a child? 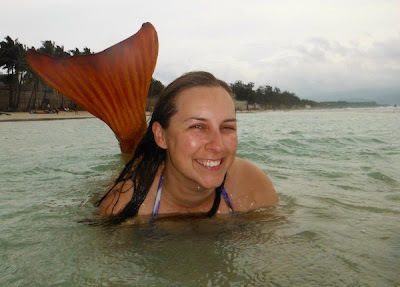 In the Philippines recently a friend and I came across a business hiring mermaid tails. It looked fun and, as it turns out, was too daft an opportunity to pass up on. 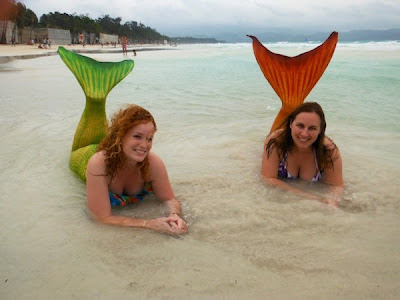 We were prepared to leave our dignity at the door as we indulged ourselves in our mermaid fantasies. It didn’t take long. The woman in the shop took one look at us both and proclaimed we would need size large. Getting into the tails was the first challenge. We walked across the beach to the water’s edge and told to sit on the sand in order to don the tails. They consist of a heavy fin-shaped board with a tight rubber foot sock attached to the top of the board, and lycra-like fabric that goes over your legs and up to your waist. With the fabric rolled down to the edge of the board we pushed our feet into the very tight rubber socks and started to unroll the fabric. It was easy enough until we got to our bums; at that point we had to roll around in a most undignified manner until we had filled our bikini bottoms with sand and pulled the fabric above them. The next challenge was getting to the deeper water. As soon as we started putting the tails on a crowd of Asian tourists surrounded us and kept taking photos of us as we rolled around like beached whales trying to get into the tails. The photographers were shameless, even pushing their children forward to pose with us. It was very strange and I hope I never see any of the photos because I cannot imagine any of them will be flattering. Once they had all calmed down a bit we managed to get sight of deeper water. We shuffled on our bums and heels for a bit and eventually had enough water to turn onto our fronts, actually kick our tails, and swim. The combination of the heavy board and the huge waves smashing us in the face was exhausting, and made us feel like we had been swimming in a washing machine, but it was great fun. 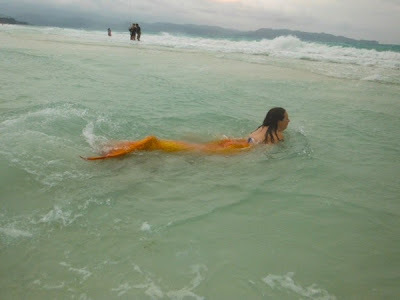 We hired our tails from dive centre Fisheye Divers on Boracay Island. They can be found at Station 1 on the Island’s famous White Beach.